It seems that everywhere you look and everything you do has a “green” option these days, such as paperless billing, recycling, upcycling, metal straws, or composting. But how aware are you of going green in the theatre scene? Broadway Green Alliance (BGA) in Booth #323 at USITT19 is doing just that. Comprised of those working within the industry, they’re advocating for greener theatres and theatre practices. 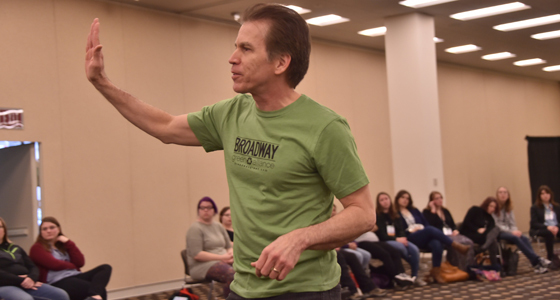 We sat down for a one-on-one interview last year at USITT 2018 with the co-chair of Broadway Green Alliance, Charles Duell, and discussed small steps to take, BGA’s roots, and Wicked’s significant mic battery reduction. tell me a little bit about Broadway Green Alliance. BGA was started in 2008. So we’re nearing our 10th anniversary. We’re very excited about that. And it is an industry-wide initiative to make theatre greener. To inspire members of the community and our patrons to do environmentally friendlier actions. if someone were to come to the BGA booth what’s one thing you’d like them to take away? The first thing I’d want them to take away is that engaging in green activities does not have a particular liveness test. That you can take small actions and they’d make a difference. The BGA is comprised of people in the theatre community. The innovations are the innovations of people in the theatre community. So as an example, if you go backstage at Wicked, where they used to use 15,000 disposable batteries each year for the mic packs, they now use rechargeable batteries. And they use 96 a year. Significant, but it’s a small action. One small action. That innovation, small as it is, has been mimicked around the world. From the West End, you’ll find that same behavior now. In Australia, you’ll find that same behavior. Theatres around the country and around the world are doing that same small thing. it’s the small step that leads to a bigger picture. 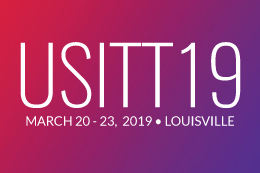 have you seen an increase at USITT or within the industry of theatres and larger entertainment companies making these small changes? Absolutely. We started many years ago on Broadway, a Green Captain program. At the first pre-rehearsal, the first organizational meeting for the show when people volunteer for different roles in the production, every show on Broadway someone volunteers to be a Green Captain. That program began on Broadway. We’ve had multiple Tony winners such as Audra McDonald, Bryan Cranston, and Ruthie Ann Miles as Green Captains. It has now spread to Off-Broadway in New York and now there are more than 60 Off-Broadway Green Captains. There are hundreds of college Green Captains around the country. Most of them have encountered the BGA through USITT Conferences. it sounds like a fabulous thing for people to be involved in. We’re actually quite grateful to USITT. You have welcomed this initiative and have partnered with us and always invite us to have a slate of programming. We’ve had increasing audiences and participation over the years and in addition to the ideas that we’ve brought to them, we’re delighted each year to hear the innovations that people we’ve met in the past have done and have brought information about their own actions to us. who are some of your personal mentors and influences? I have done a variety of things during my career that are less related to the BGA, but I will say Allen Hershkowitz from the Natural Resources Defense Council has been involved with BGA from its beginning. And the BGA started in a town hall held by Wicked. The folks from Wicked, others active in green activities in the theatre community, and Allen Hershkowitz all spoke there. The consensus from that meeting was that something should be formed that let people know what others were doing. The Broadway League then created an ad hoc committee of the Broadway League, which later evolved into the BGA. Allen Hershkowitz had a theory that he put into practice, which was, “If you’re going to be concerned about the environment, you have to bring the environment to where people are. To the activities that they’re doing that they care about.” And so he worked with the major league sports. The NBA, Major League Baseball, and the National Football League, to create green initiatives in their industries. He did the same with us and with the Oscars. And he, I believe, was greatly responsible for us doing this in a way that everybody could participate. So it was accessible for everyone? Right. So we’ve stolen principles from him, with permission. But he has been an enormous influence. Be sure to visit the BGA in booth #323 and attend one or all of their sessions focused on greener theatres and theatre practices.